Almost one month to the day of my last post I have much to say. The absence of posts for the past thirty days had nothing to do with my lacking words or events to report. In fact, much has happened and things have remained the same in many respects. I could have written but something told me to keep quiet. we must learn to trust our instincts, intuition or gut feelings. “People are illogical, unreasonable and self-centred. Love them anyway. As I reflect on my life in its entirety but particularly on my journey over the last 17 years, I see the many truths in this piece. I also recognize that May 2007 was not very different from May 2006 as I was presented with the same two options – give up in despair or trust God. There were many occasions for me to give up – too numerous for me to enumerate here. Suffice it to say, the number of broken promises, the construction of walls higher than the Wall of China, the looming possibility of unemployment and homelessness and the lack of concentration and mental capability to complete my degree were some of the main reasons to throw in the towel. May 2007 truly challenged me to surrender my plans, my dreams, my desires, in fact my life to these three physicians. One of the many things that has come of that is I met someone who is a marathon runner and who has, in the most nonchalant way, inspired me to be out more in nature. Regular readers know that I love to quote from this ‘essay’ – Reason, Season or Lifetime. This my new acquaintance is seemingly in my life if for nothing else a reason that is to get me moving, as I am now booked to travel with a team to 'cheerlead' at the Banff/Jasper Relay, for a weekend backpack camp and for couple of hikes in the Rocky Mountains! By the time this is all over – I might be wearing a size 8 instead of my current 12! My third article in May 2006 referred to the insight I had from trees – nature’s physician. That insight remained pertinent to me throughout May 2007 and even now as the wind of change is still blowing strongly in my life. One Sunday during May 2007, as I left Swiss Chalet with my dear senior citizen with whom I try to dine at least twice per month, I noticed a woman pointing at my car but I ignored her thinking she was admiring the cute streak on the side of my still fairly new vehicle. With that, I forgot about it for a week and then that same Claudette suggested to me calling my insurance company to find out whether they would cover the cost of the repair. The lovely agent after listening to my description – the fact that my car was parked in a very public place, my church yard, with the passenger side exposed on the day of the apparent incident - she gave me the telephone numbers for their approved garages. Still in a good mood, two days after speaking with the insurance lady I went to the garage. I lost it when the repair man said to me, “Lady, someone keyed your car!” I made a couple phone calls to report his comments, breathed deeply and like the trees, swayed with this ill-wind and asked how much to fix it. The fourth article in May 2006 was about broken eggs. I really love this paragraph that I wrote as it aptly describes how I felt after hearing that someone had deliberately scratched my car with their keys, causing me to fork out $500 for the deductible to cover an almost $2,000 repair job, when payments that were supposed to be coming to me were not being remitted and my job was coming to an end. Given the hard lessons that I have learned and continue to learn since October 2006, I have made every effort to watch my thoughts and my speech. In my professional life, this is called cognitive-behavioural therapy but in my personal/spiritual life we call it affirmations. The Universe by hitting me over the head with a brick helped me to get back on track, get back on purpose and so my prayers and affirmation has been to have Love (notice the capital ‘L’) made manifest in every aspect of my life. 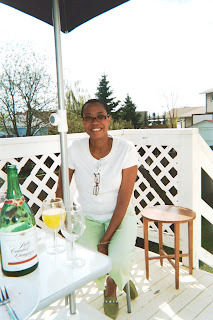 May 2007 had its ups and downs but it also had moments – which are a good thing contrary to popular belief – when I was smack dab in my life purpose. 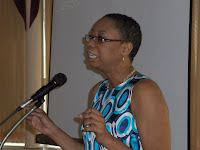 Take for example, my desire to help women, children, LGBTQ persons and new Canadians facing difficult circumstances. I prayed to be guided to ways and means to do this, to completely dedicate my every waking moment to this and my prayer was answered over and over again this May. Three days later, I was standing in a hall emceeing the Annual Benefit Concert for an organisation that supports women re-integrating into our communities from prisons. My daughter and new acquaintance, who has an interest in Afrocentric music, were with me for moral support. I think I did well as an emcee but the most rewarding moment for me was a later conversation I would have with D. Funny enough, it was in keeping with the last article I wrote in May 2006. “What I have come to learn is that I cannot live anyone else’s story or dreams. This lesson came the hard way and after many years of self-loathing, trying to live up to my mother’s expectations or to fulfill her unmet dreams. And so, at the end of May 2007, I am in a transitional place – one where I am not sure whether after June 8, I will have meaningful employment, money to pay all my bills on time, whether the young people in my life will realise that they do not need to make the same mistakes and whether the so-called adults in my life will keep the commitments made as past behaviour predicts future unless one has made a decision to change and be honest. 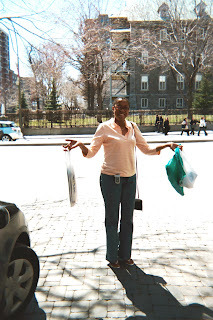 By the way, throughout this post are some photographs taken during April – May, (1) while I was in Montreal making my acceptance speech of the Chairmanship of the national organisation for Black Peoples, (2) on a 'shopping', tour in Montreal and (3) at a Mother’s Day brunch with my boys. posted by Claudette at 8:32 a.m.